Swansea City manager Michael Laudrup says Chelsea's allegation that Mark Clattenburg used "inappropriate language" to a player should have been dealt with by now. The Blues claim the referee used a racial term against Nigeria midfielder John Mikel Obi in their 3-2 defeat by Manchester United on 28 October. Clattenburg maintains his innocence and is supported by his assistants. "Why is it going on for days?" asked Laudrup, whose team host Chelsea next. Chelsea have made a formal complaint to the Football Association over Clattenburg's alleged comments, but said there was insufficient evidence to suggest Spain midfielder Juan Mata had also been verbally abused by the official. The referee has been stood down for this weekend's round of matches in the Premier League, when Chelsea visit Swansea on Saturday. 28 Oct: Sends off Branislav Ivanovic and Fernando Torres, as Chelsea lose to Manchester United. Accused of using "inappropriate language" to two Chelsea players. 29 Oct: Offered full support of referees' union, but is stood down for next round of matches. Football Association starts investigation, Metropolitan Police receives complaint. 30 Oct: Met Police begins investigation. 31 Oct: Chelsea lodge formal complaint with FA. Laudrup was questioned about the controversy during his pre-match media conference at the Liberty Stadium. "The problem here is that we let it go on too many days, so there are too many times we can talk about it," said Laudrup. "It was on Sunday, now it's Thursday and you're asking me, and it will go on and on and people will be asking about it on Saturday and on Sunday and I think 'let's get the things on the table... and deal with it'." 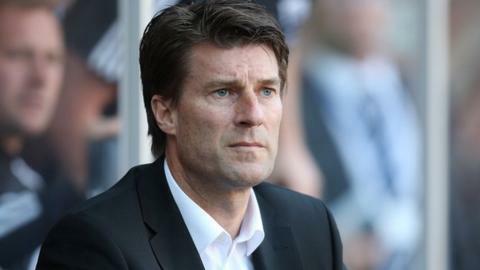 Laudrup also suggested that the football authorities should consider recording the conversations which take place between the match officials, who wear microphones and earphones to talk to each other during matches. "Don't they have the [microphone]? So it should be very easy. It should be easy [to say] here, look, everything I say is on here. Why is it going on for days and days. Or don't they record it?" Laudrup added. "Well that should be the next one... we need a recorder, a tape recorder on the mic as well." Meanwhile, Laudrup has an injury concern over central defender Chico Florez ahead of the visit of the European champions. Florez scored the opening goal in Swansea's 3-1 Capital One Cup win over Liverpool on Wednesday, but was forced to leave the field with a dead leg before half-time. "I really hope that his dead leg is coming back to life in a short time. He's a very important player for us," said Laudrup. "He is doubtful because when you get a thing like that you can normally continue. "But he had to leave, and I know Chico and he wants to be on the pitch every minute. So let's see."